Next Steps - Follow these steps once you've completed the Quick Start. Use this option to have any non-Buy Box Button, Image or Text perform as an add to cart or checkout link when clicked! In most cases, we recommend to use the available Buy Box blocks which have "Cart" and "Checkout" button destination options built-in. Using these blocks, you can easily set them up so that when a page visitor clicks on them, it will add the product to the Cart or Checkout on your store. If you're using a non-Buy Box block, then you can set the "button destination" to URL and use a Cart or Checkout permalink to mimic an "Add To Cart" or "Add To Checkout" button using the information below. Important Note: Direct to checkout links only work for the Shopify checkout. These will not work for the OCU checkout which is why we show the Cart option as well. Use the Cart option for products you've applied an OCU upsell tag to. Where 1234567890 is the product's Variant ID and 1 is the quantity. Note: You can enter a different quantity for each product's Variant ID in the URL string above. 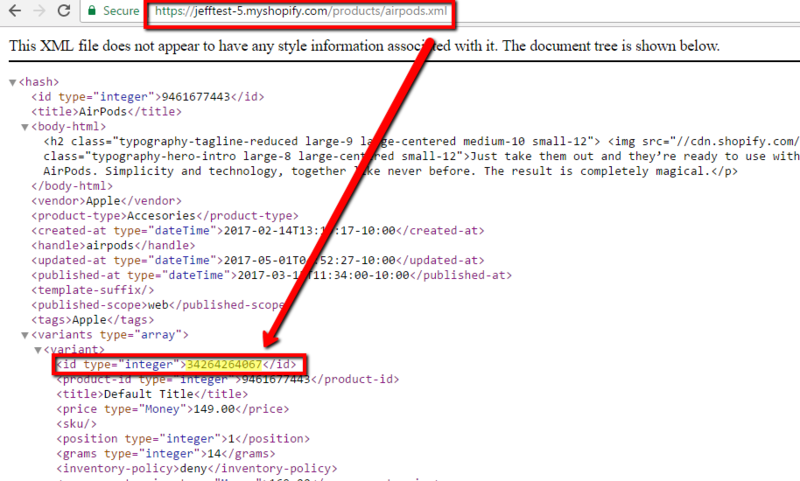 Where you append the URL string with ?discount= then enter your Shopify discount code you want auto-applied. Note: Notice the use of  in the URL string above. You can't apply different quantities for each product Variant ID. The quantity used at the end of the url above will be applied to ALL product Variant IDs added to the URL string. Go to the product detail page for the item you want to find the ID for. At the end of the URL there, enter .xml and press enter.